Jesus pointed a nail-pierced hand at a world for which He had just died and commanded, “Go into all the world and preach the gospel to every creature. He who believes and is baptized will be saved; but he who does not believe will be condemned” (Mark 16:15–16). Those thirty words are among the most famous He ever spoke. The last eighteen may be the most controversial statement Jesus made. Among those claiming allegiance to Him, it likely has been discussed more than any other. 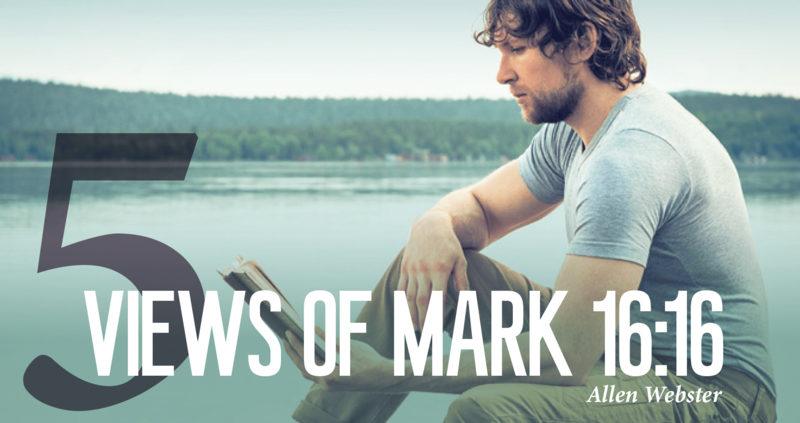 Let’s look at five views people take of Mark 16:16. Keep in mind that Jesus intended only one interpretation. God is not the author of confusion (1 Corinthians 14:33). He wants all to speak the same thing (1 Corinthians 1:10). So, ponder carefully, search thoughtfully, and decide deliberately which view you believe (cf. Acts 17:11). He who Believes and is baptized will not be saved. Atheists—who do not believe in a God to save you, sin to save you from, heaven to save you to, or hell to save you from. Non-Christian religions—who believe in God (or gods) but do not believe that salvation is in Jesus. Those who accept Jesus’ deity (John 3:16) and the Bible’s authority (Matthew 28:18; 2 Timothy 3:16) do not take this view. There is a God who offers salvation: Jehovah “desires all men to be saved, and to come to the knowledge of the truth” (1 Timothy 2:4). One is without excuse for rejecting God, for He has given ample evidence of His existence and character (Romans 1:20; Psalm 14:1; 19:1–3; Hebrews 11:6). One day all will meet Him at the judgment, where every knee shall bow, and every tongue shall confess (Romans 14:11; Philippians 2:11). Salvation comes only through Jesus: “There is one God and one Mediator between God and men, the Man Christ Jesus, who gave Himself a ransom for all” (1 Timothy 2:5–6; cf. John 14:6; Acts 4:12). he who does not Believe and is not baptized will be saved. Universalists believe God saves everyone. They reason that a loving God would not send anyone to hell and that since Jesus paid the ransom for all, all will be saved. Jesus paid for all to be saved, yet Jesus Himself taught that only a few will accept His offer of salvation (Matthew 7:13–14; 11:28). God loves all and sent His Son to rescue all from hell, but He warns that those who do not obey the gospel will be lost despite His love (Ephesians 5:5–6; 2 Thessalonians 1:7–9). he who Does not Believe and is baptized will be saved. Faith and repentance are required before baptism (Acts 2:38; 8:35–37; 17:30) and salvation (Romans 10:9–10). Since these are beyond infants’ capability, they are not candidates for baptism. Baptism in the Bible is only by immersion. It is a burial (Romans 6:3–4; Colossians 2:12). Practically no language expert and Bible scholar of any religion disputes the meaning of baptizo. It means to submerge. Baptizo was not originally a religious word. It was commonly used in the cloth trade for garments being dipped into a vat of dye. It was used in recipes where cucumbers were “baptized” overnight in a solution. Greek historian Polybius (c. 203–123 bc) applied it to a sinking ship (1.51.6), and others to describe people drowning. Baptizing infants is without scriptural precedent. There is no command for infant baptism in the Bible. Not one of the 7,957 verses of the New Testament mentions it. As infants have no sins (Matthew 18:3; 19:14; cf. Ezekiel 18:20) and are incapable of gladly receiving the word (Acts 2:41; Deuteronomy 1:39; Joshua 24:15), they cannot be proper subjects for baptism. By practicing men’s tradition of sprinkling, we fail to keep God’s command of immersion (Matthew 15:3–9). It is sad to think of many who believe they were baptized but were not. he who Believes and is Not baptized will be saved. This view is held by those who follow John Calvin’s theology of salvation by faith only. They hold that one is saved by faith without baptism. One can be baptized if he chooses or may even be required to be baptized to join a denomination, but immersion is said to be only an “outward sign of an inward grace.” Grace (salvation) was received earlier. The Scriptures teach that faith saves but not faith alone. Salvation is given to those who believe in and obey the Father (Matthew 7:21; Luke 6:46). Faith and baptism go together. Apart from faith, baptism has no efficacy; apart from baptism, faith does not save (Hebrews 5:9; James 2:14–26). Both are essential (Matthew 28:18–20; Galatians 3:26–27). The thief on the cross, someone might say, was saved without baptism (Luke 23:43). True, perhaps (he could have been baptized by John before his crime, John 3:23), but he died before Jesus ever said Mark 16:16. He lived under the Old Covenant, which differed from the gospel and was nailed to Jesus’ cross (Colossians 2:14). The church was not established during his lifetime. If Jesus had said, “He who believes and is baptized shall receive a new iPad,” no one would think that only one condition was necessary to receive the gift. Puts one into the kingdom (John 3:3–5). Grants remission of sins (Acts 2:38). Anytime baptism and salvation are mentioned in the same verse, baptism is always listed before salvation. Brings gift of the Holy Spirit (Acts 2:38). Results in rejoicing (Acts 8:38–39; 16:33–34). In Acts, baptism was never delayed for a future baptism service. Fulfills a command (Acts 10:48). Washes away sins (Acts 22:16). Puts one into Christ’s death, thus into contact with His blood (Romans 6:3–4; Revelation 1:5). If we could travel the 8,000 miles in distance and 2,000 years in time back to the cross, we still could not apply Jesus’ blood to our sins. It is contacted only through baptism. Raises one with Christ into a new life (Colossians 2:12). Puts one into Christ/puts Christ on (Galatians 3:27). Baptism doth also now save us. Baptism doth also not save us. If you were asked to erase the one that you do not believe, which would you erase? If you removed the first, then you have erased God’s Word, and that action brings a curse (Revelation 22:18–19). Both cannot be true, so that leaves erasing statement 2.
he who Believes and is baptized will be saved. This view takes Jesus’ words at face value. Jesus said what He meant and meant what He said. The second. How? By not confessing Christ and being baptized but thinking he will be saved anyway. The third. How? Though baptized, he is not living the life of faith Jesus requires (Titus 2:11–14). Much is written and said on this subject, but only the Scriptures matter in the end (John 12:48). Reread these verses. If it helps, think of being isolated on an island with only a Bible, with no prior religious knowledge or interaction with religious teachers. Then “work out your own salvation with fear and trembling” (Philippians 2:12). If you have never been baptized in compliance with Mark 16:16, ask yourself, “What hinders me from being baptized?” (Acts 8:36). Do not let any circumstance, person, or emotion stand between you and pleasing God. Finding salvation is life’s most important quest (Matthew 13:44–46), so make sure to get this one right.